On June 5th 2017 the New Yorker magazine published a long feature article entitled “The Addicts Next Door”. The article described the desperate situation in the state of West Virginia where an increasing number of people of all ages have succumbed to the syndrome of opioid addiction. Not only are the emergency services in much of the state stretched to the limit dealing with addicts and their problems, but a depressingly large number of these people are dying from inadvertent overdoses of the drugs on which they are dependent. As Nora Volkow, the director of the National Institute of Drug Abuse, recently wrote- “In 2015 two million people had a prescription opioid use disorder and 591,000 suffered from a heroin use disorder; prescription drug misuse alone cost the nation $78.5 billion in healthcare, law enforcement, and lost productivity.” Around 60,000 people died from opioid overdoses in 2016 and the numbers will probably increase this year. The New Yorker article is one of many that describe different aspects of what is now commonly known as the “Opioid Epidemic”, a medical crisis which, in its severest forms, is unique to the United States. When reading such articles, or listening to commentators on different media, one is constantly bombarded with words such as heroin, fentanyl, morphine, Vicodin, OxyContin, naloxone and so on. However, it is doubtful whether a normal person who is not trained in medicine or some branch of medical research really knows what these things are, making it difficult to appreciate exactly what the crisis is all about. Heroin and fentanyl are opioid drugs- that is true enough. But what exactly are they? How do they differ from one another and what is the specific role of each of these substances in the current epidemic? In this post I will attempt to provide an answer to such questions for the lay reader. In order to begin this discussion, we need to go back to the 19th century and the birth of a new type of science called “Organic Chemistry”. Prior to this time, it was thought that the materials that made up living things like animals and plants were endowed with a special life force, and were subject to unique physical laws that did not apply to nonliving objects such as rocks, ores, minerals and so on. However, certain key scientific results showed that this was not the case. These included the synthesis in the laboratory in 1828 of the substance known as urea (a chemical normally excreted in the urine). Results such as these demonstrated that the substances that made up all living matter were certainly subject to the ordinary laws of chemistry. Organic chemistry concentrates on the chemistry of the carbon atom which is of particular importance for understanding the structure of all living things. Many of the important molecules in living organisms consist of large carbon based polymers and are studied by a special branch of organic chemistry called “Biochemistry”. As the 19th century proceeded scientists became more and more familiar with organic chemistry and how it could be used to synthesize or modify natural products. A highlight of this occurred in 1859 when a young English scientist named William Perkin accidentally produced the first synthetic dyestuff from the organic molecule aniline. He named his new synthetic dye “mauve”. Prior to this time all dyes used for making clothing or other items were derived from plants or animals using very labor intensive processes. Now it became possible to produce these things synthetically. A new industry known as the “Chemical Industry” was created to deal with making such products. Indeed, the names of some of these companies today still reflect their origins e.g. the huge German chemical company BASF-“Badische Analin und Sodafabrik (Baden aniline and soda maker)”.These companies were very successful and soon began to diversify. They found that some of the substances they made weren’t very good dyes but did have interesting therapeutic effects as synthetic drugs. So, some of them became drug companies and the pharmaceutical industry was born. One of the first of these new pharmaceutical companies was the Bayer company founded in Wuppertal, Germany in 1863 and, as we shall see, this was to have an enormous impact on the future of opioid drugs. What exactly are opioid drugs? Even the earliest written records going back to Mesopotamia around 3000 BC refer to the remarkable properties of the poppy plant. It was known that extracts of the poppy had a number of important effects on mood, the sensation of pain, the control of diarrhea and so on. These properties were well known and described by the Greeks, Romans and other ancient peoples. In particular, the white gummy latex that encases the seeds of the poppy was found to be the most active part of the plant. It was possible to take this latex like material, boil it a little, and then dry it out in the sun to make a thick resin that could be shaped into balls or bricks. This is the material that we know as crude opium. Originally this would have been eaten either alone or frequently mixed with other ingredients. In the 16th century the alchemist Paracelsus discovered that you could extract opium with alcohol and drink it. He called this preparation “Laudanum”. But what exactly is in the opium that is responsible for its drug like effects? Virtually all of the material in crude opium is irrelevant. However, somewhere in this sticky mess is a pure substance, an organic chemical with a specific molecular structure. This only makes up a few percent of the opium but it is responsible for most of the its effects. This substance was first isolated from opium in 1805 by a young German pharmacist named Friedrich Serturner. When he fed it to animals (or students) they fell asleep and so he called it “morphium” after Morpheus the god of sleep from Ovid’s Metamorphosis. The name changed to morphine when Serturner’s discoveries were translated into French (Fig 1). Some years later another pure substance was isolated from crude opium. This was the drug codeine whose chemical structure turned out to be very similar to that of morphine (Fig 1). However, a small alteration renders it much less potent. Nevertheless, codeine is still an extremely useful drug for treating pain, cough and diarrhea, three of the effects that are also produced by morphine. Soon after its discovery, people started to take advantage of “pure” morphine instead of crude opium and a German apothecary named Emanuel Merck began to prepare it in bulk and, in 1827, started to sell it from his shop. In 1853 the hypodermic syringe was invented allowing morphine to be injected intravenously. This increased the rate at which at which the drug worked as well as its effectiveness, but also accentuated its problems such as its tendency to produce addiction. researcher at St Mary’s hospital in London, took morphine and treated it with a chemical reaction known as “acetylation” producing diacetyl or diamorphine. Animal tests showed that, like morphine, this new substance was a potent opioid drug, but the research was never followed up and became a footnote in the scientific literature. However, 23 years later scientists at the Bayer drug company were also playing around with the same chemical reaction. They treated the substance salicylic acid, a natural product isolated from the bark of the willow tree, and produced acetylsalicylic acid which they found was very useful in reducing fever. They called their new product aspirin. The Bayer scientists wondered if something similarly useful might be obtained by treating morphine the same way-maybe one might produce something like codeine or even something better? Of course what they produced was diacetylmorphine. As was the custom at the time the Bayer scientists tested their new substance on mice and also on themselves. They were impressed. It made them feel “heroisch”, German for heroic and super strong. So, they called their new substance heroin. 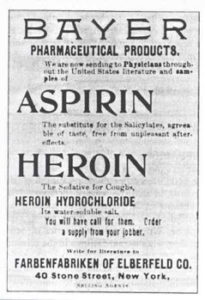 Remarkably, on the same day in 1898, Bayer began to market its two new discoveries, aspirin and heroin (Fig 2). The rest, as they say, is history. in medicine (Fig 3). These drugs were all first made in the early 20th century and all have very similar properties to morphine and codeine, representing very small chemical alterations to the original molecules. However, there is another reason for wanting to mess around with the chemical structure of morphine. It is very difficult to make morphine from scratch in a laboratory. A poppy has spent hundreds of thousands of years evolving a special set of biochemical reactions allowing it to make morphine, which has an intricate chemical structure, consisting of 5 interlocking ring systems. Really, the only way to obtain morphine or codeine efficiently is to isolate them from poppies. You can also isolate thebaine from poppies, an inactive molecule whose structure is related to that of morphine. 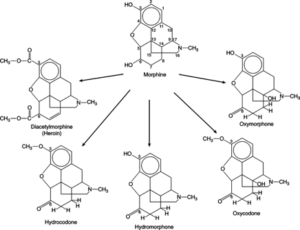 Then it is relatively simple to make opioid derivatives like oxycodone or oxymorphone. But how can we free ourselves from the poppy and make drugs like morphine from scratch? Scientists began to ask how much of the complicated morphine molecule was actually necessary for producing its effects in man? As discovered in the 1970s, opioid drugs work by activating a special protein expressed by some nerve cells called a μ-opioid receptor. Was the entire chemical structure of morphine necessary for activating this receptor or would just part of it do? Chemists began to deconstruct the structure of morphine first taking away one ring system from the structure, then another and then another. What they found was that the opioid activity of many of these synthetic molecules persisted. Perhaps the entire structure of morphine was necessary for some unknown function it had in the poppy plant ,but it clearly wasn’t necessary for producing molecules that could activate μ-opioid receptors in humans. make synthetic antispasmolytic drugs and invented a completely synthetic substance called pethidine (now also called meperidine or Demerol). By chance , pethidine was observed to have powerful opioid activity. Indeed, it was the first completely synthetic opioid drug. Pethidine is a much simpler chemical substance than morphine and only contains a single ring structure called a piperidine ring –a feature that it shares with morphine. No poppies are necessary for making pethidine ; you can make the entire thing from beginning to end in a laboratory. Around the same time, IG Farben developed another completely synthetic opioid called methadone which also has only a passing resemblance to morphine. Developments such as these clearly demonstrated that effective opioid drugs could be synthesized in a laboratory without recourse to poppies (Fig 4). Soon after the war in 1953 Janssen Pharmaceutica, a relatively new company that was founded by Dr Paul Janssen in Belgium, began to develop their own opioid drugs based on the structure of pethidine. Eventually, after considerable experimentation, they developed a new synthetic opioid named fentanyl. Not only was fentanyl completely synthetic but it proved to be around 50-100 times more potent than morphine. Within three years, fentanyl was being used clinically in Europe. As we shall see ,this is not the end of the story to which we will return later. One other important development should be noted. As long ago as 1915 an industrial chemist synthesized a compound called N-allylnorcodeine, a derivative of codeine. What he surprisingly observed was that this substance didn’t mimic the actions of codeine but rather inhibited the effects of the latter drug or indeed of morphine or heroin. Nobody noticed this important contribution to the scientific literature until the 1940s when N-allylnormorphine (nalorphine) was synthesized and was also found to produce the same inhibitory effects. These substances are what are known as opioid antagonists. Here is one way to think about it. We know that drugs like morphine and fentanyl work by activating μ-opioid receptors. You might imagine that the receptor is a lock and that the opioid drug is a key that fits into it and unlocks it. These drugs are called opioid agonists. Some opioids (more “potent”) are better at fitting into the receptor and turning it on than others. In contrast, an opioid antagonist fits into the receptor but cannot turn it on. However, by fitting securely into the receptor an antagonist prevents any opioid agonist drug doing the same thing and so inhibits its potential effects. Eventually very efficient opioid antagonists such as naloxone (Narcan) and naltrexone (Revia) were produced. These drugs are able to rapidly reverse any of the effects of drugs like morphine no matter whether they are “good” effects such as analgesia or “bad” effects such as depression of respiration. Because of this property they are widely used for treating people who have taken an overdose of any opioid agonist drug. They rapidly reverse these effects and therefore often have a life saving role in the treatment of addicts. How did the opioid epidemic come about and what are the roles of these various drugs in its genesis? To understand this, we need to go back to the 1980s. At that time access to opioid drugs was fairly restricted particularly for patients with chronic pain problems.This was because of fear that they might become addicts. However, this attitude began to be questioned. It has recently been pointed out that a 150 word letter published in the New England Journal of Medicine in 1980 helped to foster the view that very few “patients” treated with opioids eventually became drug abusers. Attitudes began to change. It seemed that millions of Americans were suffering from chronic pain syndromes of various types and were being denied the use of opioid drugs that might make their lives more bearable. As a result, prescriptions for opioids became much more generally available. As the medical community encouraged the appropriate use of these drugs, pharmaceutical companies responded with new preparations of opioids. Drugs like Vicodin and Percocet began to be widely prescribed. One should understand that these aren’t actually new drugs at all. The idea is to take the two major type of pain killing drugs, opioids and nonsteroidal antiinflammatory drugs (NSAIDs) like aspirin, and mix them together. Vicodin is just a common or garden mixture of hydrocodone and acetaminophen (Tylenol) and Percocet is just oxycodone mixed with acetaminophen. Another widely used opioid preparation is OxyContin which is nothing more than a controlled release form of oxycodone. All this means is that the drug is formulated in such a way that it is released slowly in the body over a period of 12 hours in an effort to keep the drug at a constant level over time. The idea here is that patients would only have to take two doses a day to maintain constant pain control which, on the face of it, seems like a good idea. When the drug was introduced it was backed by a huge advertising campaign aimed at doctors and patients.Why take something else when you only had to take OxyContin twice a day? The drug was a huge success and sales skyrocketed into the tens of billions. The problem was that things didn’t quite go according to plan. Lots of people did get hooked on opioids like OxyContin that they were initially taking for bona fide purposes. Around 2010 it was realized that there was burgeoning problem with the way opioids were being prescribed and the consequences for promoting drug addiction. So ,the pendulum began to swing back the other way. Prescribing opioids became more restricted once again. But now there were a large number of people who were dependent on OxyContin and other prescription opioids who needed a source of drugs. Because access to opioids was now more restricted, the price of drugs like OxyContin and other prescription opioids began to rise. The price of heroin on the street was much lower. This meant if you were an addict it became much more reasonable to cash in your dose of OxyContin and buy six doses of illegal heroin. And so many people who had begun by taking prescription opioids ended up as addicts buying heroin on the streets. However, why are so many people dying from illegal opioid use? As we have seen a drug like fentanyl is much easier to make than heroin and is also much stronger. In principle, therefore, it is much easier for a drug dealer to make or obtain fentanyl than heroin and the same amount of illegal drug goes much further if you cut your heroin with it. But think about what might happen. Let us say you are used to taking a milligram of a white powder consisting of pure heroin to get high. Now you are presented with some white powder which is actually fentanyl or perhaps heroin cut with fentanyl. If you take the same amount of white powder you are actually taking an enormous opioid overdose. When an opioid drug enters your bloodstream it will be distributed to the various tissues of your body. If the cells in a tissue express μ-opioid receptors, then the drug will produce an effect. We know that these receptors are widely distributed in the nervous system which is why morphine produces many different effects. Receptors exist in the spinal cord and the brain which mediate the effects of the drug on pain. Receptors in the gut mediate the constipating effects of the drug. Effects in the brain mediate the effects of the drug on mood and consciousness. Note, however, that there are also opioid receptors that regulate your breathing. Activation of these receptors suppresses breathing. If you take a large dose of an opioid, you will completely stop breathing and die. Taking an opioid drug therefore is always a balancing act so that the dose you take produces effects that are therapeutically relevant and are not high enough to produce life threatening effects such as the suppression of breathing. The problem is that the use of fentanyl as a street drug has now lured many unfortunate addicts into situations where they inadvertently overdose and kill themselves. Lately things have taken an even more ominous turn. The chemical structure of fentanyl is easily modified using a little organic chemistry. When this is done you can make drugs that are even more potent than fentanyl, which is already some 50-100 times stronger than morphine. Drugs like sufentanil or carfentanil are up to ten thousand time stronger than morphine. The current world champion is ohmefentanyl clocking in at some 30,000 times more potent than morphine! Imagine what this means. Even a tiny crystal of the drug that you cannot even see would be enough to kill you. Now underground chemical laboratories, especially in other countries like China, have figured out that by making drugs like this they can just ship a kilo or so to the USA, a quantity that is not that difficult to conceal, but is enough to incapacitate the whole of Chicago. Once heroin or other drugs are cut with even tiny amounts of drugs like this the results are devastating. The effects of such drugs on breathing can be reversed by continuous dosing with opioid antagonists like naloxone. But the supplies have to be available and medics have to be recruited in sufficient numbers so that they can rapidly respond to distress calls from addicts. Because of the reasons discussed above the Opioid Epidemic represents a problem of the greatest complexity. However, the basis of the problem is rooted in the effects produced by opioid drugs themselves. Is there really some way of making drugs like morphine that are free of their addictive potential or fatal side effects? Over the last year papers have been published in the top scientific research journals Nature and Science suggesting that this might be possible. I will describe these results in a future post.